"This is a drink served throughout Mexico. It is made with several different fruits. This is a watermelon drink." 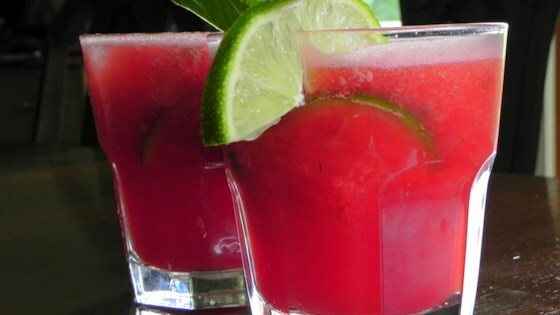 Puree the watermelon and water in a blender until smooth. Add sugar to taste. Cut the lime slices in half. Place a half lime slice into each of 8 glasses along with 3 mint leaves. Crush with a cocktail muddler, then fill each glass with ice. Pour in the watermelon agua fresca, and stir before serving. Awesome! I just made one. It was a single serving and I added uhmm a bit of rum. LOL. Fab Fab Fab!